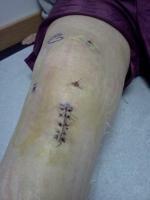 I injured my knee a month ago playing street hockey(goalie). I could not straighten my left leg, and when I walk and try to give it full extension, my knee would give out. I could not sit on the floor on my knees with my bum touching my ankles. extreme pain behind the knee. After a month I had pain free walking movement and could almost sit all the way back onto my heels with little pain. Last night I re-injured it doing a diving catch in Baseball, exact same symptoms as last time. Just wandering if it is obvious what it is. Meniscus or ACL is my guess. I wear a brace on my right knee for a partial ACL and MCL tear. I have worn it for 3 years now. With out the brace I cannot play any sports with any kind of turning, the knee would give out. With the brace I can play any sport with confidence. I would appreciate any guess as specialist appointments are 1 to 2 year waiting list in Calgary, Alberta, Canada.